This is an easy, fast recipe for spring asparagus - which soon will be available from Morning Glory Farm on the island, as well as from a few growers selling at the West Tisbury Farmers Market when it opens later this spring. The eggs, imported Parmesan reggiano, and a bit of pasta water create a luscious, creamy sauce that coats the pasta and vegetables. Cut the asparagus on the diagonal to make the dish look prettier. Prep the asparagus and mushrooms in advance of cooking the pasta, so the timing of the dish works. For other recipes with asparagus, check out the asparagus article I wrote for Martha's Vineyard Magazine which features Morning Glory Farm and tips for using asparagus. Heat the largest skillet you own on medium high. Add 1 tablespoon of the oil and asparagus and cook for 4 minutes, stirring often to make sure all sides of the asparagus are cooked. Add a pinch or two of salt. The asparagus will be crisp tender. 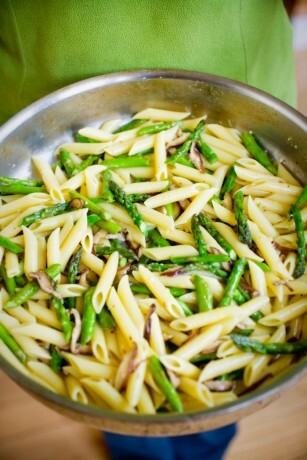 Place cooked asparagus into a bowl and set aside. In the same skillet, add the remaining two tablespoons of oil and reduce the heat to medium-low. Add shiitake mushrooms, stir for a few seconds, and then add garlic. Sauté, mixing often, until mushrooms are cooked, 3 to 4 minutes. Season with salt and add to the asparagus. Keep the skillet handy, as you’ll be putting the pasta in it. As the pasta cooks, whisk the eggs, Parmesan, lemon zest, and lemon juice together in a bowl. Season with salt and pepper. When the pasta is nearly cooked, ladle out 1/3 cup pasta water and slowly whisk the hot water into the egg mixture. Drain pasta and immediately place into the large skillet. Add the sauce to the hot pasta and mix well. Add the asparagus and mushrooms. The heat of the pasta should be enough to warm the asparagus and mushrooms, but you can put the skillet on low heat if necessary. Taste and add additional salt and pepper if needed. Serve hot.